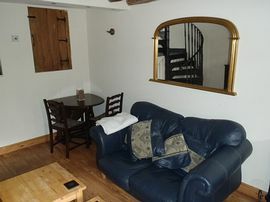 We have really tried to create a home from home atmosphere in Penn Cottage. 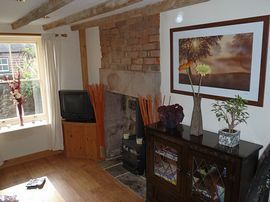 The lounge has a feature gas fired log burner, exposed beams, solid wooden floors. A bespoke cast iron spiral staircase leads up to the newly fitted kitchen with fridge, washing machine, microwave and full equipt with all the utensils and equipment you might need! From the kitchen a door leads out to the private garden area with table, chairs and a BBQ if you are lucky with the weather! 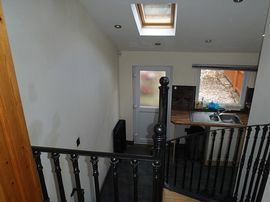 Up the spiral staircase again, is a beautiful open plan double bedroom, with king sized bed and views across to the hills and Chevin. 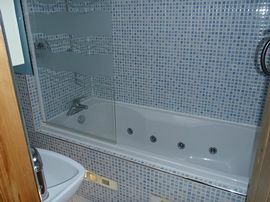 The bathroom is newly fitted out with power-shower, jacuzzi bath and underfloor heating. The cottage is not to be missed and is perfect for a romantic break away, or even a comfortable base for work in the area. Gas burning stove in the lounge. Rear and front gardens. BBQ and seating area in the rear garden. The garden is secure for dogs. 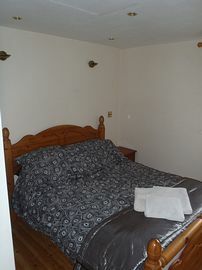 The cottage is £40 per night off season and £60 per night in high season. Discounts are available for longer stays. Check in is always 3pm on the day of arrival and departure by 10am on the day of leaving. Please contact us if you have special requirements and we will do our best to help!